Do I need to lift heavy weights to build muscle? Posted 12 May 2010 under Ask Us. No. You don’t need to lift heavy weights to strengthen and tone muscles on your body. 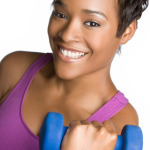 You can build muscles by doing toning exercises, lifting light weights, or playing sports. You can even strengthen certain muscle groups by doing activities such as cleaning your room and carrying your book bag.